So where are you and your spouse headed for a date this week? Perhaps you have already had your date? No matter, the key is having a time set aside in your weekly calendar that is reserved for just the two of you. Remember when you were dating before marriage? Oh, how you planned, maybe even connived to accomplish seeing each other? Nothing would stop you. HOLD IT RIGHT THERE! May I ask a question? Why did you stop dating after you were married? Have you stopped? Why? Talk a walk down the street/road/through the park, hand-in-hand, telling each other why you love them. Share an ice cream cone from Dairy Queen, Chickfila or Sonic. Take your time and enjoy each other’s company. Let the kids romp in the playground at Burger King or at the park, and the two of you hold hands, put your arm around each other (you have to sit on the same bench to do so! ), talk, and tell your kids, this is your time. They need to learn to respect you and your space. It won’t hurt ‘em! After all, you are teaching them what marriage really looks like so they will be prepared when the times come for them to be married. Spend some time under the stars and no cell phones!!!!!!!!!! By the way, fall is coming, so build a fire and roast marshmallows. Watch a bunch of funny, clean videos on Youtube and laugh and laugh and laugh, or stop by a local card store and read all the funny cards to each other. Don’t make excuses for not dating! All of the suggestions above are cheap, but marriage is not cheap. It’s worth everything you put into it! 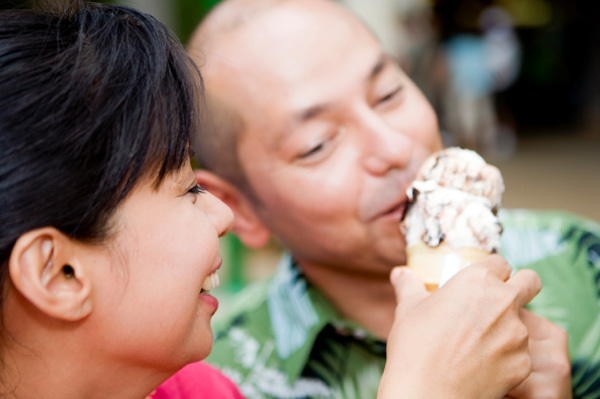 So, what are you and your spouse going to do for date next?